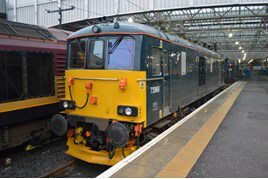 Caledonian Sleeper (CS) is sending a Class 73/9 to the Velim test track in the Czech Republic. The electro-diesel, owned by GB Railfreight (GBRf), will be used for testing the Mk 5s on order for CS, which are being built by Construcciones y Auxiliar Ferrocarriles (CAF). For much more on this EXCLUSIVE story, including details of the test, which '73' is heading abroad and when, read RAIL 818, published on January 18.